New York (TADIAS) – Each week, as part of President Obama’s Winning the Future initiative, the White House recognizes champions from various sectors — ranging from educators to entrepreneurs and community leaders — and honors them for the work they are doing to serve and strengthen their communities. 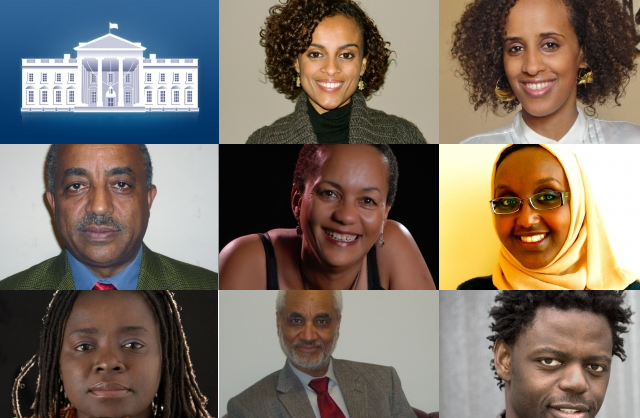 Last week the White House recognized 14 “Champions of Change” who are leaders in American Diaspora communities with roots in the Horn of Africa. In the next few weeks Tadias Magazine will feature an interview series with several of the champions. We start with Ethiopian-born Solome Lemma, a philanthropist, activist, and organizer. She is currently a grantmaking program advisor at The Global Fund for Children (GFC). Solome is a graduate of Stanford and Harvard Universities. TADIAS: Solome, please tell our readers about yourself, where you grew up, your passions and top priorities? Solome Lemma: I was born in Ethiopia and migrated to the US when I was 11. I lived in Marietta, GA for a year and spent the rest of my childhood in Los Angeles, California, until I went off to college. Since then I have lived in New York, DC, Boston, and Ethiopia and traveled to many countries in Africa. My passion is in seeing an Africa that is in charge of its own development and progress. An Africa that tells its own story, drives its own change, and sets its own agenda. TADIAS: Through your non-profit work with the Global Fund for Children you have worked with grassroots organizations in over 25 countries in Africa. Can you share some of the highlights of that experience? SL: Wow, so many incredible memories and highlights. I loved organizing a knowledge exchange conference in Senegal for grantee partners in English and French-speaking parts of West Africa. We held the exchange in Toubab Dialow, right on the beach and it was incredible to see people forge connections and lasting relationships despite the linguistic divides. After the conference, I had an opportunity to visit and stay with the great writer Ayi Kwei Armah. I will never forget him cooking dinner. We had a great conversation about Africa, literature, and following one’s authentic purpose. Throughout that Senegal trip, I remember saying to myself I can’t believe this is my life over and over again. Sierra Leone was such a beautiful surprise. Before I traveled there, all I knew about the country was the long conflict . Once I got there, I found the most breathtaking, stunning place I have ever visited. Rolling hills, lush green trees, gorgeous white sand and Turuquoise water. River number two is a must visit. And While I am on that, Zanzibar still has a piece of my heart. The most inspiring part of that work was meeting the incredible grassroots leaders who are the backbone of change in their communities. I have met the most driven, resourceful, creative, and impactful organizations in Africa. During my last visit in Mombasa, Kenya, I met with two brothers who were forced into the streets at the ages of 4 and 7. They lived on and off the streets into their teenage years. Today, they run am organization that works with children who live on the streets called Total War Against AIDS Foundation (TWAAYF). These two young men have turned their misfortunes into an incredible organization that uses the creative arts, music, education, and love to prevent other children from experiencing their fate. Visiting the Joy Center in Ethiopia is always a great source of inspiration. The Joy Center is the first and only school for children with autism. I have visited the organization every two years since 2006 and it’s incredible for me to see the change in the students overtime. One particular young lady couldn’t move, speak, or eat on her own when I visited the first time. When I returned two years later, she was playing basketball and communicating with her teachers. Another two years later, she was talking to me. It’s a place where love and care make miracles. TADIAS: Describe the project you are currently working on to focus on members of the Diaspora as agents of change. SL: I am working to establish an organization that will promote philanthropy among the African Diaspora Community. We are the most educated immigrant group in America. The global African Diaspora sends $40 billion in remittances each year. Imagine how much change we can advance if we consolidate our resources to engage in collective philanthropy, supporting the work of African social change organizations. It’s time for us to step outside of the shadows of development and philanthropic organizations and take our rightful place as resources, sources, and agents of change. Congratulations! Your accomplishments and bona fides provide us all with inspiration and pride. Great news. Congratulations Solome. Well deserved! Looking forward to hearing from the rest as well!! What an inspiration! Kudos to all that you do. Please provide ways one can participate in these local initiatives. Thanks. I have supported GFC for a long time and wonderful to see Solome recognized! At The Global Fund for Children, they work hard to create a world where all children have the opportunity to learn, grow, and thrive. All the while showing us that grassroots organizations have the power to make any vision a reality. Good work! If only there was a way to reach all the African Diaspora like me who want to do more than send money to relatives back home. It would be great if there was a crowd sourcing site that we can use to pool resources for specific projects..